That is a really wonderful image. 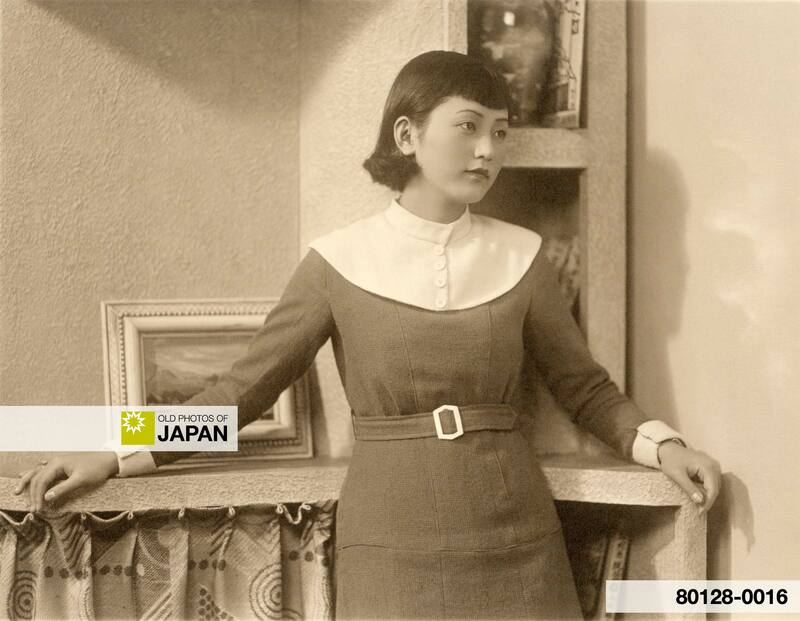 This is the same woman as in 1930s • Woman with Modern Hairdo, in this image it shows more of her modern dress as well as part of the Western-style studio. For more information, see the earlier mentioned article. You can also licence this image online: 80128-0016 @ MeijiShowa.com. I guess it takes somebody who is really into photographs of this period to appreciate a photo like this. There is a great story attached to this photo. I found a batch of photos, including this one, at a temple market in Osaka. I immediately fell in love with them, but for some weird money-pinching reason only bought a few of them. The moment I got home and looked at them again, I regretted it. One month later I went back to the same market, found the vendor, but he told me that he had sold the other ones. Regret, regret, regret. Fast forward some two years, New Year’s in Kyoto. Some old friends who used to live in Japan are visiting and we decide to visit a huge temple market in Kyoto which is famous for its New Years’ Market. One of my friends calls me to a stand saying that he just found some great photographs that he thinks I will really like. Expecting to be disappointed I slowly stroll to the stall, and immediately recognize the vendor. Yes, the same guy of two years ago. Something begins to tingle in my back as I move towards my friend and point my eyes towards his hands. In his hands he holds the very same photographs that I didn’t buy two years earlier. Naturally, this time I buy them all. How about that? It is almost like a fairy-tale, don’t you think? I told my friends that if you found a scene like this in a movie you’d walk out disgusted with the schmaltz and improbability. Good improbable things do happen sometimes.